Jackie MacMullan penned a powerful and timely quintet of articles on mental health last week. Of them, the third piece focused on whether or not to medicate was quite heavy. Mental health battles aren’t specific to athletes but the combination of high pressure, changing scenery and constant scrutiny definitely add to the struggle. Why do you think fans are often so vile towards players on social media? You’d think in a world and a league where players have been humanized more than ever, people would stay their hand but the vitriol you see sent out via social media is insane. Bohlin: In this day and age, it seems more likely than ever before that we will see those sorts of messages shared with athletes on social media no matter what is going on with said player or the team they represent. Whether that is a result of a change in how people perceive athletes or simply a case of more people having a voice that can reach these sort of players via social media opening up a brand new platform for those types of messages to be passed along is certainly up for debate, but it’s quite clear that these sort of issues are becoming more and more prevalent in our society. Given the type of financial investments that franchises are making in players today, it’s understandable that organizations would want to know as much as possible about a player before offering them a contract as a free agent. On the other hand, there is something to be said for these players being able to live out their own private lives even though they are public figures. Kaskey-Blomain: Social media provides fans with a direct line of access to players in a way that has never been available before. This access is a double-edged sword, as it gives players an outlet to express their thoughts and interact directly with fans, but it also allows for anonymity that many people abuse. Many of the comments directed at athletes on social media would never be said in a face-to-face setting, but the behind-the-screen aspect of social media provides fans with a sense of security that too many take advantage of. Kosel: Yes, we live in an age where athletes and their personal lives are so open to public scrutiny that society should be more compassionate, yet it’s not remotely the case. Unfortunately, this reality doesn’t surprise me—even if we limit our focus to supposedly mature adults. At the end of the day, professional players are still regarded as strangers and they have one simple job function to carry out. No matter if one happened to share a laugh with an idol on Facebook Live or chuckled at the fact that Anthony Davis likes to play practical jokes on his friends on Instagram in much the same manner, the No. 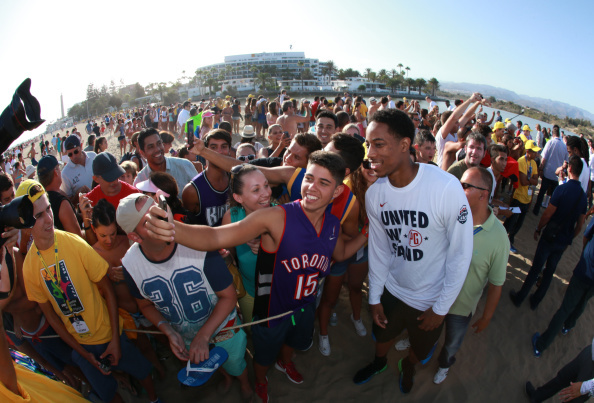 1 priority for fans is deriving immediate satisfaction from all of the time invested following the world of sports. You’ve put in the long hours, and now human nature unfairly demands results. Just as we have all been reinforced with the argument of no excuses, the same concept applies to favorite teams and players. Additionally, every day life is more complex than ever and oftentimes exhaustingly burdensome. Sports are counted on to offer temporary relief from the madness. Everyone has problems; everyone needs an escape. If suddenly that comfort and delight is replaced by disappointment and poor performances—say a social media follower is having a bad day, and in the back of his mind remembers the chasm difference in paychecks for the umpteenth time—then sigh. Nehm: That’s a question I struggle with regularly because it’s very clear only a select few folks would actually say the things they say on social media to the players in person. Largely though, people know it’s wrong and yet they still do it. I think online anonymity has a lot to do with it. If you can hide behind a stock photo and a handle that has nothing to do with your name, you can feel like you can say whatever you want and no one will ever know who you are. The other thing is just the sheer size of the Internet. These players are followed by so many people and receive so many comments that I’d guess most folks that say vile things think their comment will never be read and if it is read and it gets a response, they can feel like it’s their moment in the sun. Rafferty: CJ McCollum had an interesting conversation with Blake Griffin about mental health on the latest episode of his podcast that is worth listening to. They basically talked about how NBA players are often viewed as robots and that they, like us, get anxious and depressed about things. Making the amount of money they do helps in some ways of life, but, as DeMar DeRozan said in one of MacMullan’s pieces, it doesn’t make them immune to everyday problems. It’s also easy for people to hide behind a computer screen nowadays and send a message to pretty much anyone in the world. While they are a lot of people who look up to and appreciate the DeRozans, McCollums and Griffins of the NBA from speaking about their struggles with mental health, they are a lot of people who think they have nothing to complain about, too. On a lighter note, looking across the League, which team has the smallest gap in talent between their best and second-best player? Carter: The Warriors. Steph and Durant. It wasn’t that long ago that sports media folk posed the question: is Steph Curry the best point guard ever? Sheesh. KD just won back-to-back MVPs in the Finals. I’m not a fan of the team because, selfishly, I want to see competitive ball. They’re a fun team to watch and they play a beautiful brand of basketball. As a fan, though, I want suspense. 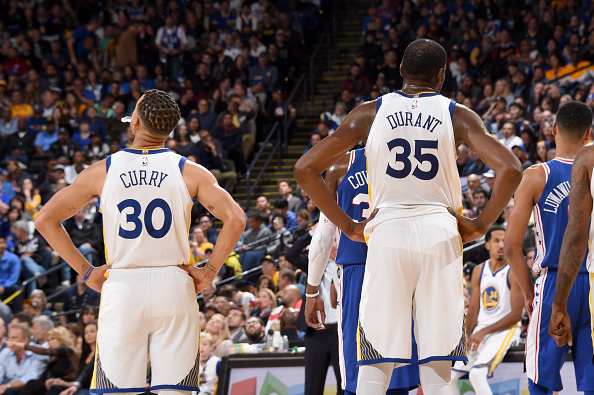 Kaskey-Blomain: The Golden State Warriors are the most talented team in the NBA, and the talent gap between the top two players on the team—Kevin Durant and Stephen Curry—is rather small. Both are perennial All-Stars, former MVP’s and future Hall-of-Famers, and a legitimate argument could be had regarding which player one would rather build a team around. The Houston Rockets (James Harden and Chris Paul), Oklahoma City Thunder (Russell Westbrook and Paul George) and Philadelphia 76ers (Joel Embiid and Ben Simmons) also come to mind. Kosel: There’s several prominent examples that come straight to mind—James Harden and Chris Paul or Russell Westbrook and Paul George—but I’ve got to give the nod to Kevin Durant and Stephen Curry. 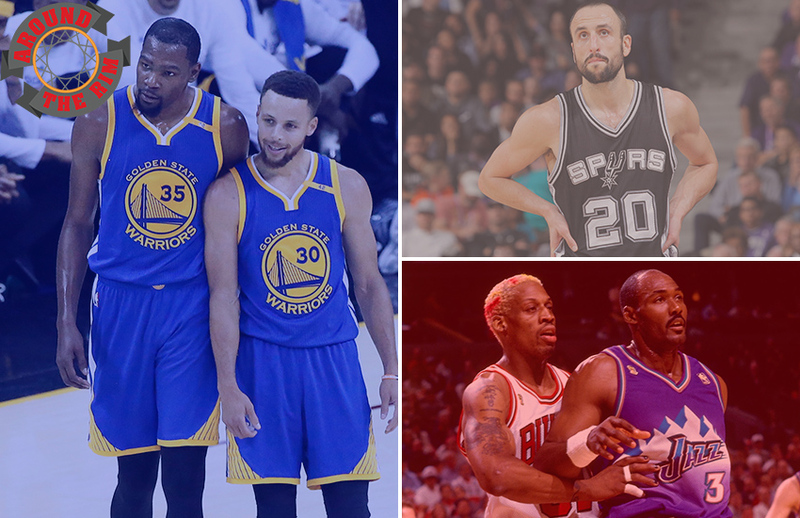 When you think about the crème de la crème of the NBA, these two Golden State Warriors sit in that rarified best-of-the-best air, and seemingly on a weekly basis, it’s hard to find consensus on who should be 1A and 1B. In their unique ways, they’re just both so good and unstoppable. Nehm: This question is incredibly difficult to answer because I struggle definitively rankings players and instead tend to place players in groups. Those groups can be fluid and context-dependent, which makes this even more difficult. Also, there are a number of teams that simply don’t have undeniably great players, which means their players that I don’t get incredibly excited about might be very close together in terms of talent. So, since I find it easier to rank players and their talent at the very top of the NBA I narrowed it down to three teams: Golden State, Houston, and Oklahoma City. 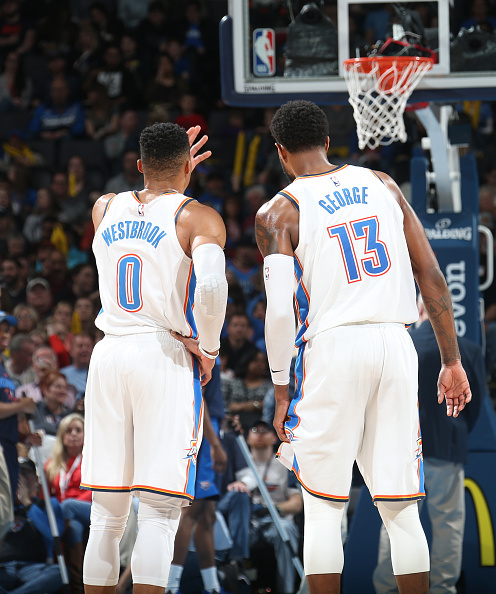 I keep Westbrook closer to the bottom of the Top 10, so he and Paul George are pretty close, but Westbrook’s ceiling is still higher, so it’s not them. Two years ago, I think you could make a slightly better argument for Chris Paul, but his age and Harden’s ascendance split them too far apart, which leaves the Warriors. I think you can argue Kevin Durant and Steph Curry are somewhere between the 2nd and 6th best players in the NBA with MVP ceilings, which makes me believe they have the smallest gap in talent. Rafferty: It has to be the Golden State Warriors, with Kevin Durant and Stephen Curry. It doesn’t matter who you think is the better player out of the two because they’re both top-5 players and perennial MVP candidates. And as Curry proved in 2016-17 and Durant proved in 2017-18, they’d both likely be the favorites to win the award if they had the Warriors all to themselves. After the Warriors is where it gets interesting. 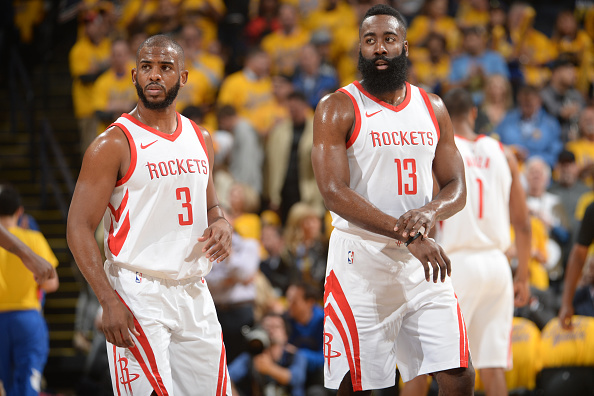 The Houston Rockets certainly have a case, with James Harden and Chris Paul. The same goes for the Oklahoma City Thunder (Russell Westbrook and Paul George), Utah Jazz (Donovan Mitchell and Rudy Gobert), Washington Wizards (John Wall and Bradley Beal) and Portland Trail Blazers (Damian Lillard and CJ McCollum). You also have younger cores—Ben Simmons and Joel Embiid in Philadelphia, Devin Booker and Deandre Ayton in Phoenix, Nikola Jokic and Gary Harris in Denver—that could move much higher up on this list depending on the development of their second-best player this season. Bohlin: There are a number of different angles that can be taken with regard to this question but it seems like the obvious answer is the right choice. Entering the 2018-19 campaign, the team with the smallest gap in talent level between their best two players, in my opinion, would have to be the Golden State Warriors. With Kevin Durant serving as my choice for their No. 1 talent, the gap between him and their No. 2 player, which is Stephen Curry in my eyes, is the smallest gap of any duo in the NBA given how each player has established himself as one of the best that the NBA has to offer and they have MVP honors to back those claims up. Heading into next season, taking into account big money deals, transition years and player movement, which player has the most to prove? 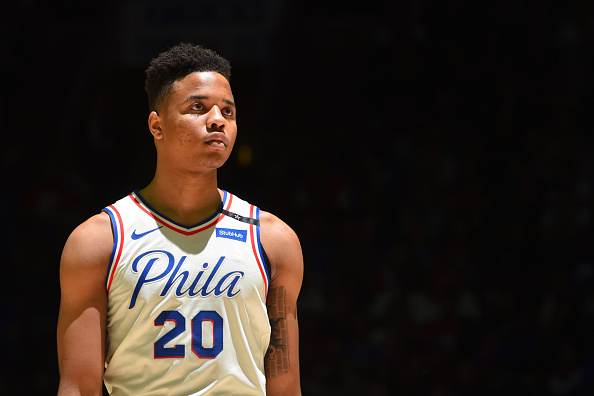 Kaskey-Blomain: I could be a bit biased here, but I see Markelle Fultz as having the most to prove in the 2018-19 season. The Sixers traded up to select first overall in the 2017 draft, and he remains a big question mark for the organization at this point in time and it can’t stay that way forever. The Sixers drafted Fultz to be a high-impact backcourt player that could play off of Simmons with the capability of stretching defenses and knocking down shots, while also having the ability to generate his own offense. Things obviously didn’t work out that way during his rookie campaign, but Fultz—who is not yet 21—is still oozing with potential. If—and this is a big if, and something we won’t know until we see him out on the floor—Fultz is able to put the shooting and confidence issues that plagued him last season behind him and become the player that the Sixers drafted him to be, the team could be adding a third star—or at least a very solid contributor—this season. Fultz has heard all the bust talk. He saw what Jayson Tatum did as a rookie for the Celtics last year. Now he has to respond. Kosel: To go from the face of the San Antonio Spurs for the next six to eight years to forcing your way out of the most revered organization in the League, Kawhi Leonard gets my vote. Most players, of course, have dreams of playing in front of their hometowns, but this potential MVP candidate turned down supermax money to get away from Gregg Popovich. In what world does that make sense? And on top of pondering the mental stability factor, can Kawhi be relied upon to appear in enough games to lead a team deep into the playoffs? He’s only surpassed 70 regular season games played just twice in his seven-year career. Nehm: I’m not sure this will be a particularly interesting or unique answer, but it has to be Kawhi Leonard. He has been out for the last year and actively avoided the Spurs throughout the season. It’s one of the crazier stories you could ever imagine from one of the NBA’s quietest stars in one of the League’s most respected organizations. As someone who covers the Milwaukee Bucks, I’ve been asked over and over again throughout the summer if Giannis Antetokounmpo or Kawhi Leonard is the best player in the Eastern Conference. Until we see Leonard play again, I think it’s Antetokounmpo. And grabbing the title of the best player in a conference, even the East, feels like an awful lot to prove. Rafferty: Probably Andrew Wiggins. Not only did he see his numbers drop across the board in 2017-18, this is going to the first of the $146.5 million extension Wiggins signed last summer. If he takes a big step forward—be it as a three-point shooter, a playmaker or a defender—perhaps it’s enough to convince Jimmy Butler to stay in Minnesota long-term when he becomes an unrestricted free agent next offseason. If he doesn’t, it’s hard to imagine Butler thinking Minnesota is his best shot to compete for a championship in his prime when the likes of the Los Angeles Lakers and Philadelphia 76ers will have money to spend in the summer of 2019. It’s not just about Butler either. 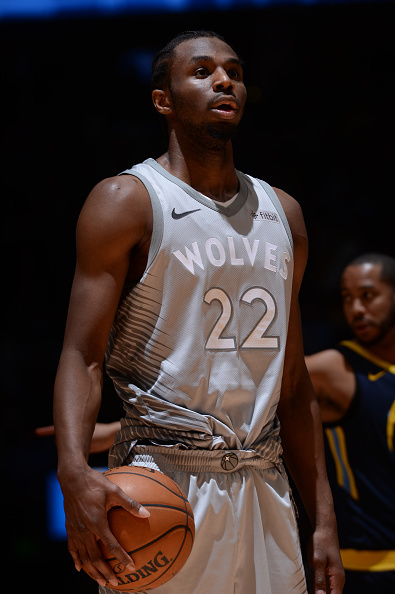 If he walks but Wiggins shows signs of improvement this season, the Timberwolves would be able to shift their focus towards building a future contender around a one-two punch that could, in theory, rank as one of the best in the NBA. We already know what Karl-Anthony Towns is capable of. Now it’s Wiggins’ turn. Bohlin: Despite all of the options that are out there, the player with the most to gain heading into the 2018-19 season, in my opinion, is Denver Nuggets guard Isaiah Thomas. Given everything that has happened to Thomas over the course of the last two seasons—the former All-Star went from a player who would likely receive a lucrative long-term contract during the summer of 2018 to a player who had to simply sign on with the Nuggets in search of an opportunity to show the rest of the League that he is still the same player he was prior to his hip injury. While Thomas will not start for Denver, he should have plenty of chances to show that he can score the ball at a high level, which could be enough to prompt a team to make him the type of offer in the summer of 2019 that he was expecting this past July. Carter: I’d say Kawhi Leonard. I’m curious to see if he’s really a true superstar that can lead a team when he has expectations, or if he’s really better served being a No. 2 guy with another star that handles most of the pressure. It’s not that I think the Raptors need to win it all or even compete to win it all. But that cupboard isn’t bare. He should make them better. And after forcing his way out of San Antonio, whether people think he was justified or not, I think public opinion on him could sway drastically if he underperforms—not that he still won’t get big money next season anyway. We just wrapped our all-time top 50 on the Hot Takes and Shot Fakes podcast. Who is someone that you usually have higher than the masses when these lists drop outlet-to-outlet every offseason? 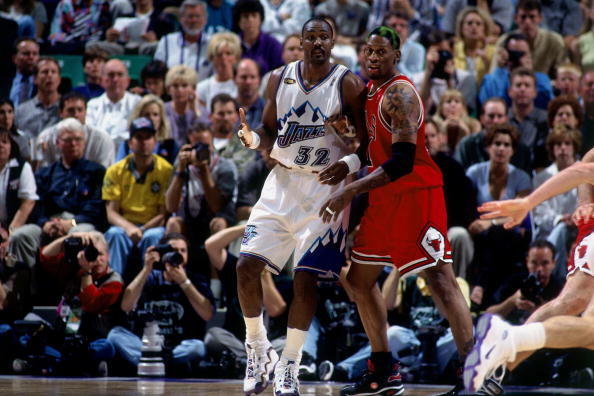 Kosel: One player whose career deserves plenty more accolade and should be mentioned in the same breath as other top 50 players is Dennis Rodman. Throughout most of his career, he impacted each game so much. My first NBA love was Michael Jordan and he used to walk on water, but whenever his earlier teams faced Detroit, the Pistons usually got the better of the Bulls and The Worm often played a huge role. Then later, when these two joined forces in Chicago, they flattened the competition for three straight years, including that magical 72-win 1995-96 season which culminated in an easy romp through the playoffs to one of five titles for Rodman. It’s no fluke that this Bad Boy and all of his teams consistently took home so much hardware. Nehm: I’m not sure if this actually happens, but it certainly feels like it does. Karl Malone regularly looks to be a little bit too far down on people’s lists of all-time greats and thus I’m here to tell you: Karl Malone was really good, y’all. I feel like there is this strange sort of backlash against him because a bunch of people feel he is a #compiler, which has strangely become a bad thing in recent years. And I get it, you don’t want to just reward guys for playing forever and instead want to look at their peaks. So, Malone gets bumped down because people feel like he just hung on forever to grab more numbers, then tried to grab a ring with the Lakers in the end, and ended his career ringless and all about numbers. But a career 25 points and 10 rebounds average with 14 All-Star Games, four All-Defense honors and two MVPs should put him closer to 10 than 25 in the all-time rankings. Also, if you want a guy who had a ridiculous peak but won’t get his due because of an injury…check out Sidney Moncrief’s five-year peak from 1981-86 before his knees sabotaged his career: 21 PPG, 5.8 RPG, 4.7 APG, 5x All-NBA, 5x All-Defense and two Defensive Player of the Years. Eww. Rafferty: He’s still very much in his prime and he’ll probably move up the board several more times before his career is over with, but I wouldn’t be surprised if Stephen Curry creeps into the top 10 when it’s all said and done. He’s already a three-time champion and a two-time MVP, and he’ll likely end his career with more career threes than anyone in League history. Enough can’t be said about his impact on the game. Carter: I’d love to go homer-Philly guy here and say Charles Barkley, who I think given his rebounding numbers as a 6-4 power forward, is underrated. Plus, I think because he often plays the clown on television now, people forget how great he was. 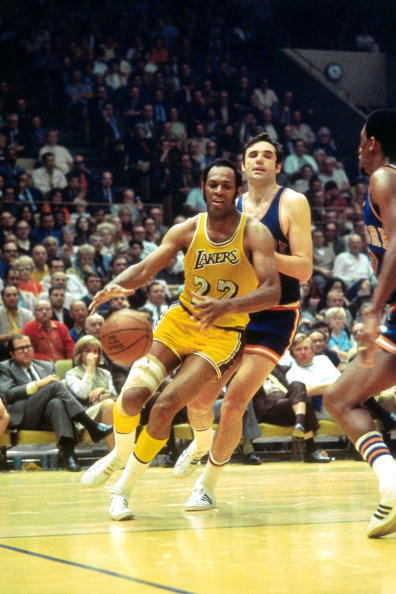 But, I’m going with Elgin Baylor here. The man averaged 34.8 points and 19.8 rebounds in 1960-61 and followed that with 38.3 and 18.6 the next season. Yet he’s rarely mentioned in the upper echelon. But I admit bias. My old man played in that area. Bohlin: While it was his antics off of the court which most people remember him by at this point in time, Dennis Rodman was one of the more impactful players that the League had to offer during his time in the NBA and his résumé reflects that as he contributed in major ways to five championship teams while also managing to make the All-Star Game on a pair of occasions despite the fact that he never had a dominant offensive game to speak of. Rodman’s impact could easily be overlooked if you’re just scanning box scores but everything that he did for his teams that did not show up on the stat sheet are big parts of why his teams were so successful. Kaskey-Blomain: I usually tend to rank Dennis Rodman a bit higher than most, as I don’t think the impact that he had on each team that he played for during the first 12 years of his career—the Pistons, Spurs, and Bulls—is discussed enough. The Worm was a big part of the reason that the Pistons were able to win two titles during his time with the team, and he was invaluable to the Bulls during their second threepeat. He brought a tenacity with him everywhere he went, and you have to appreciate a player that is willing—and eager—to do the dirty work. 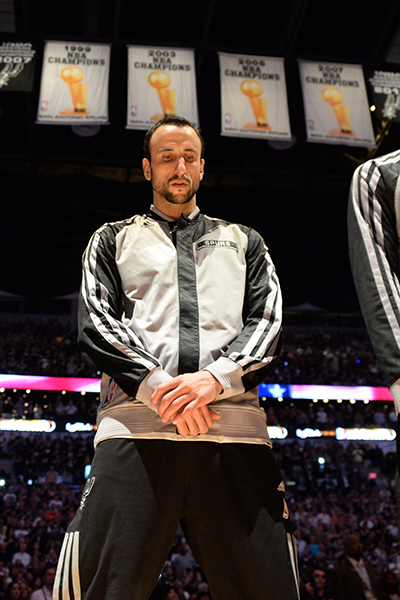 Now that Manu Ginobili is officially retired, is he a top 50 player ever to you? Nehm: I don’t think so. 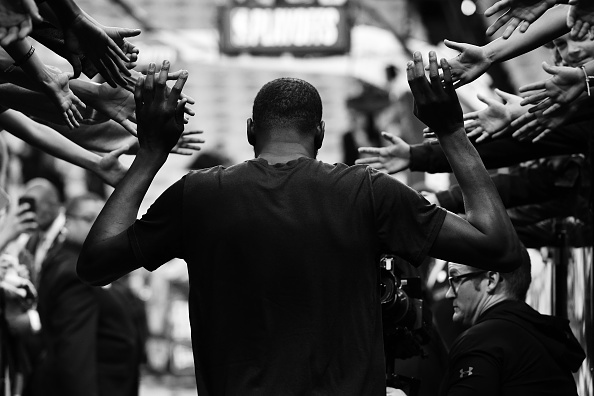 Being a sixth man limited his peak from being as impressive as it could have been for a player of his talent level. He’s an incredible winner and a huge part of the dynastic Spurs, but I just don’t think he did enough to stack up against the rest of the top 50. He’s not outside of it by much, but I don’t think he’s done quite enough. Rafferty: I struggle to rank players all-time, but Ginobili’s top-50 case is fascinating. Having come off the bench for two thirds of his career, Ginobili would have likely made more than two All-Star teams and two All-NBA teams had he been a full-time starter. That obviously shouldn’t take away from what he did accomplish, though. He’ll go down as one of the greatest—and arguably the greatest—sixth men we’ve ever season and he was a huge reason for the San Antonio Spurs’ dominance from the early 2000s until now. Throw in his accomplishments overseas, and there aren’t many players who can match Ginobili’s resume. Bohlin: Now that Manu has made it official by announcing that he will retire rather than return to the San Antonio Spurs for the 2018-19 season, the discussion of where he ranks all-time is as relevant as ever. Given everything that he has done to help grow the game globally, in addition to his impact on the Spurs’ dynasty, I would think that you can absolutely make the argument that he is a lock for the Hall of Fame and could easily be in the top-50 when it comes to lists like these. As a two-time All-Star and a four-time NBA champion, it’s hard to question his resume when it comes to comparing Manu to the all-time greats. Carter: Love Manu. Love what he did for the Spurs, the sacrifices he made and the style in which he played. But I think the fact that he made those sacrifices means we don’t know what he would have done with more responsibility. We can only extrapolate. I’m hard-pressed to put him in the top 50 because I don’t know who I’d take out. Again, love his game. Love that he showed up in the clutch. But to be in the top 50 of all time, to me, that’s a bridge I can’t cross with Manu. Hall of Famer though, for sure. First ballot. Kaskey-Blomain: As great as Ginobili was/is, I don’t consider him to be a top 50 player of all time. 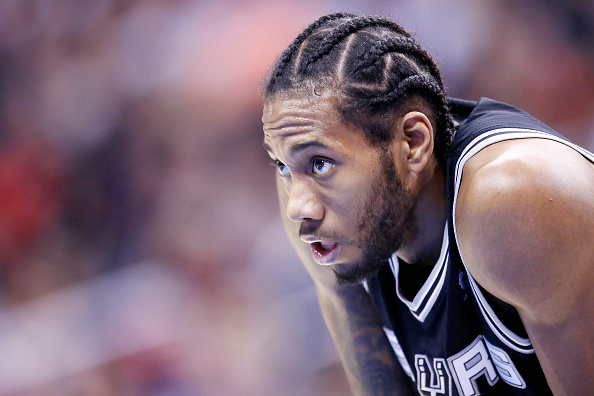 He was always a major contributor for the Spurs, but he was never the guy. He never had to carry the team over the course of a season and a playoff run. His career stats (13.3 points, 3.8 assists, 3.5 rebounds per game) don’t jump off of the page. Ginobili was an All-Star-caliber player for a long time—and super fun to watch—but in my mind the top 50 is reserved for certified superstars, and he just isn’t there. Kosel: When I consider the greats of the game, I want to see an impressive list of accomplishments alongside an accompanying warrior-like constitution. Manu Ginobili has both in spades, so please, please ignore the middling career averages. For the good of the San Antonio organization, he agreed to come off the bench for a significant portion of his career — in this day and age circus of too many me-first attitudes, this aspect should be lauded whenever apt. 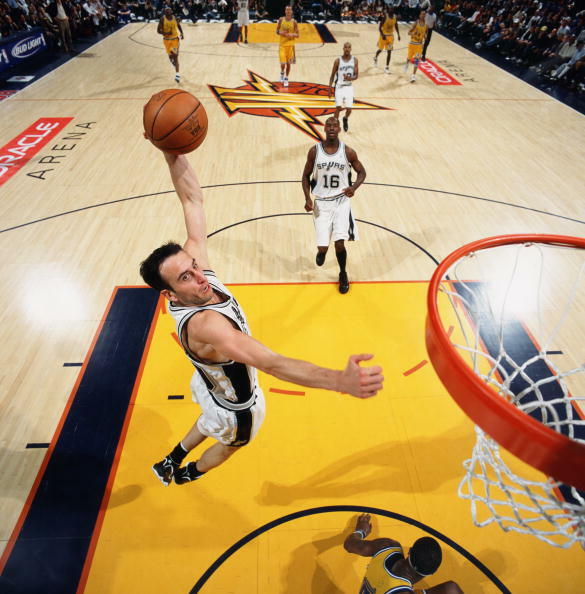 Consequently, focus your attention on the fact that Manu was always a tried and true winner. Ginobili is a four-time NBA champion. He led Argentina to Olympic Gold in 2004. He has taken and made a lot of big shots in his career. During the 2008-09 season, where he was forced to miss the playoffs due a stress fracture in his fibula, the 54-win San Antonio Spurs were upset by the Dallas Mavericks in the first round, winning one miserable game in the series despite still having world beaters in Tony Parker and Tim Duncan out on the floor. Manu Ginobili a top 50 player? Yeah, with ease.